How do your past experiences affect your life today? Do you find yourself struggling to with your daily activities? How are you affected mentally, physically or spiritually? Past trauma can raise havoc with our present day relationships, our ability to make a living, and our security by eroding self-esteem or complicating our lives with depression or addiction. Unhealed trauma can cause or exacerbate chronic physical maladies. That annoying back pain may mirror feelings of a lack of support from friends, family or coworkers. Headaches can indicate a tendency to belittle ourselves with self-criticism. Stomach disorders such as ulcers or IBS can reflect an emotional block or a refusal to let go of a person or situation you can no longer tolerate. Listen to what your body is telling you and take action to get to the heart of the matter. Often we don’t even remember events that interfere with our progress. Pain can be repressed; buried so deeply that we are seemingly unaware of it. Though we may not consciously acknowledge it, unresolved emotions can still cause impulsive or destructive behavior. They wreak havoc with our intimate relationships and chip away at our trust in the world in general. Sometimes we deny our pain and pretend it never happened, thinking it will go away if we ignore it. This is not a solution. Our discomfort is left to fester below the surface and can suddenly reappear in inappropriate ways, causing further damage. In order to heal past trauma, we must first be willing to face it logically, with a clear head and an open heart. It has been said that pain is a great motivator. Once we have suffered long enough at the hands of erratic and tyrannical emotions, we become willing to face our fears and recover. Having paid the price, we can make a conscious decision to let go of it and move on. Call on Spirit to assist and strengthen you in this process. Fearlessly examine what is happening in your life as a result of unhealed trauma. If you are not ready to face your past yet, ask Spirit for the willingness to do so. Create time to meditate and self heal with Reiki. Pure Reiki energy will treat both physical and emotional pain. 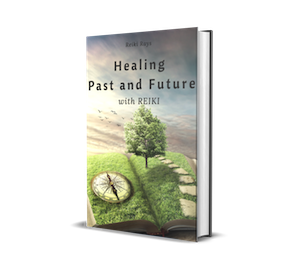 Use Cho Ku Rei to call in a powerful stream of Reiki healing and Sei He Ki to soothe and calm ragged emotions. During this process, remind yourself often to live in today. There is nothing that can be done to alter the past. We can only change how it affects our lives in the present moment. Though this sounds simple, for those of us with unresolved issues, it is something we need to actively work on every day. Once you have become willing to inventory the details of your past, get a pen and paper and list them. This practice will bring the issue to the here and now. When you see things in black and white, they become real and concrete, and therefore, easier to work with. Remember, you are not experiencing the feelings associated with these events at the same level as when they happened. Now you can see them from the perspective of mature emotions. They will not hold the same power over you. Because of this, you can document your list thoroughly so you can be done with it all at once. Talk about the trauma with a trusted friend or a professional counselor. Though it may not be easy or comfortable, sharing our experience out loud with another is a sure method to find relief. This vital step assists us in the next phase: forgiveness. Our most painful experiences can be neutralized when we understand that people who inflict pain, whether knowingly or not, are in pain and suffering themselves. Coming to a place of forgiveness will ensure that the trauma no longer dominates you. Allow yourself some time for this to happen. It may very well be a process and not an event. Consider it an investment in your future happiness. If you have followed the preceding steps in detail, you have removed a major barrier to your present day happiness. Conclude your cleansing experience with a ceremonial rite that will offer you release and a new sense of freedom. Plan your ceremony at the full moon and use its light to illuminate every dark corner of the past that is holding you back. Light a candle or a small fire. Ground to mother earth and breathe deeply. Use Cho Ku Rei to start the flow of Reiki and use any other symbols you are attuned to that feel right to you. Call in Spirit, your Ancestors and your Spirit Guides to assist you. Burn your list under the light of the moon. As you do this, state out loud that you are ready to release all that no longer serves you. Let go of the past and free yourself of limiting beliefs or toxic situations. Remember to practice Reiki self-healing daily. Your healing will come if you are willing and really want it.